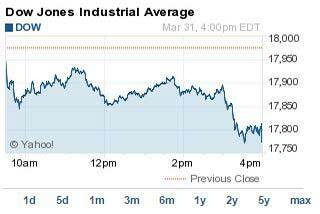 The DJIA Index plunged 200 points Tuesday. The cause? Energy stocks drove the market downward as Iranian nuclear deal talks weigh down oil prices. The markets pared gains from Monday's massive rally. Basic materials stocks were the biggest decliners Tuesday. Dow Chemical Co. (NYSE: DOW), Freeport-McMoRan Inc. (NYSE: FCX), and Air Products & Chemicals Inc. (NYSE: APD) all lost more than 1.4% on the day. The S&P 500 Volatility Index (VIX), the market's fear gauge, gained 5.3% on the day. What Moved the DJIA Index Today: Talk of a potential nuclear deal between the United States and Iran pushed oil prices downward. Western nations and Iranian leaders have extended negotiations through Wednesday, although the deadline could be pushed back until June. Brent oil, priced in London, fell roughly 2.4% to $54.90 per barrel. WTI crude, priced in New York City, slipped nearly 2.6% to fall below $47.42 per barrel. 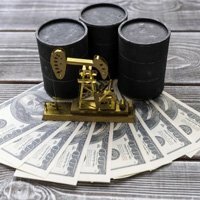 But to assume that a deal would fuel lower oil prices immediately is a mistake, according to Money Morning Global Energy Strategist Dr. Kent Moors. "The 'Iranian card' will have no short- or medium-term impact on oil prices," Moors said earlier in March. Richmond Fed President Jeffrey Lacker stated his case today for the U.S. Federal Reserve to raise interest rates in June. The noted hawk on monetary policy dismissed recent economic data and blamed wintry weather for muted growth in the economy. Lacker noted the labor market, consumer spending, and several other key data sets have shown strong improvement over the last year. Retailer Rally: Shares of JCPenney Company Inc. (NYSE: JCP) jumped 7.4% after the retail giant received a price upgrade from Piper Jaffray. The investment bank raised its target level from $13 to $14 and reaffirmed its "Buy" rating. Analysts said the company was facing positive momentum in revenue and that spring weather and marketing efforts are in the company's favor. Daily Deals: It was a second consecutive day of big deals in the markets. Commercial real estate investment company CBRE Group Inc. (NYSE: CBG) announced it will purchase Global Workplace Solutions, a real estate services business of Johnson Controls Inc. (NYSE: JCI), for roughly $1.5 billion. JCI shares rose 1.2% on the day. Endurance Specialty Holdings Ltd. (NYSE: ENH) said it will purchase reinsurance firm Montpelier Re Holdings Ltd. (NYSE: MRH) for $1.83 billion in cash and stock. Montpelier shares were up nearly 1% on the day. ENH shares slipped nearly 5% on news of the deal. Money Morning Tip of the Day: Not every special situation or "turnaround" play will be profitable. But these three catalysts all point to a company's successful turnaround. Investing in companies that are in the midst of a turnaround can be risky. You have to be willing to put your hard-earned money into companies with steep losses. And not all can succeed and produce big gains for investors. Here are three tell-tale catalysts that can help you find these big-profit stocks. No. 1. A Solid Recovery Starts at the Top. I like to see fresh blood at the top for a simple reason: When companies get into trouble, it often follows from a series of bad decisions by senior management. So, if the company needs to go in a new direction, that requires execs who will bring in new ideas and approaches with them. If a board of directors isn't willing to change leaders, it isn't serious about righting a sinking ship. No. 2. The Company Must Find New Growth. To convince key customers, lenders, and investors that it has embarked on a new direction, a once-troubled firm has to offer more than just lip service. It must have something new to deliver. This can include new products, markets, or ways of doing business. No. 3. The Company Must Improve Its Financials. In all the years that I've analyzed turnaround firms and their stocks, I've yet to see one that didn't need at least some improvement in its balance sheet. Of course, we like to see lots of new sales. But if the firm can't improve its cost structure, sooner or later it's going to end up in financial trouble.